Back in March, Google and LG Display mentioned that the pair were working together on a new VR/AR display that would be unveiled in May. 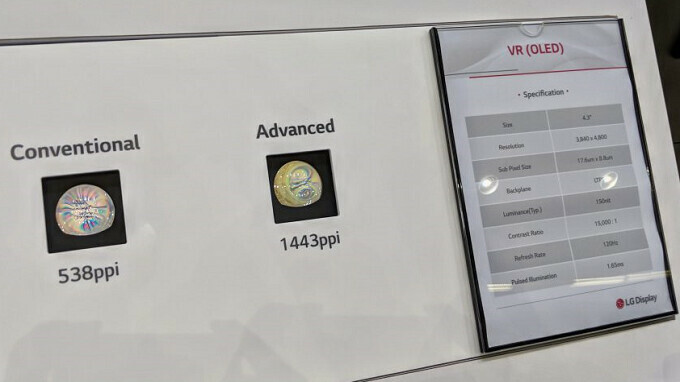 And sure enough, the 4.3-inch panel was introduced yesterday at the Display Week 2018 expo in L.A. The new display features a resolution of 3,840 x 4800 and 1,443ppi. It features a 120Hz refresh rate and a 120 x 96 Field of View. Two of these panels can be used together, each covering one eye. The panel is optimized for mobile VR and AR use and weighs in at 18MP. It currently is the "world’s highest-resolution OLED-on-glass display." Google's own research paper on the display points out that the upper bounds of human sight is a resolution of 9000 x 9600 and a Field of View of 160 x 150. A custom high bandwidth driver Integrated Circuit is in use, and a technique known as foveated rendering allows the user to see what he/she is looking at in HD, while the background fades around that subject. When used with a mobile device and powered using a mobile chipset, the refresh rate might have to be reduced to 75Hz. Still, the new panel is far and away superior to the current displays used on VR headsets, which average 2MP. That's a massively impressive display that is certain to make VR an even better experience. VR is a cool tech that is undoubtedly here to stay. Being able to move from a 2d experience to a 3d experience is quite a massive immersion difference. OLED could already do 120 hz or fps for years. A more recent example of that is the OLED EVF in the Sony A9. Sony's micro OLED displays have also been capable of more than 2,000 ppi, so the real novelty here, is the much higher total resolution and the blurring around the area you're looking at, to massively save on processing. Very impressive. This is what VR needs. Just going to need a couple of gtx1180's to get a half decent experience. Maybe you can buy one of those mining rigs in a year when crypto crashes and the prices for video cards drop so drastically, you can get 2x 1080ti for the price of one regular 1080 in today's market.